Every now and again, a game comes along that reminds us just how superior a local co-operative multiplayer experience can be compared to a solo romp, under the right circumstances. 39 Days to Mars, an interesting little multiplayer puzzler from a developer called It’s Anecdotal, illustrates this point quite clearly. It provides a unique collaborative gaming experience, using a charmingly simplistic line drawing aesthetic with a steampunk overlay, and a diverse pallet of chuckle-worthy puzzles. 39 Days to Mars is like an artistic and technological endorsement for the concept of communication and teamwork. The game all but requires two people to approach the potential of maximum efficiency and enjoyment. In some ways it feels more like a sociological experiment whose purpose is to strengthen and refine communication between 2 people than an actual game. You’ll be required to rigorously exchange ideas, suggestions, and directions, and quite literally work hand-in-hand to solve the several mini-puzzles throughout, with each player controlling one hand to initiate various actions and movements. These include working multiple cranks to guide a key on a string to an electrical power supply, clumsily assembling segments of a map and, perhaps the most vital, concocting the perfect cup of tea for our distinguished protagonists, Albert and Clarence. I certainly felt like I needed a caffeine boost when powering through some of these puzzles. The game’s narrative is as bare-bones and simplistic as the content itself, which runs at a meager hour or so, depending on how long you fumble through each puzzle. While the title makes it sound lengthy, each of the “39 days” coast by in mere seconds of time in-game once you’ve reached a certain point. In a simplistic hand drawn animation containing borderline stick figure drawings, Albert and Clarence are sitting around reading the newspaper, and of course, sipping tea. Suddenly one of them poses the idea of constructing a spaceship to Mars, to which the other proclaims what an excellent idea that sounds like - and you’re off. The few other bits of characterization and backstory are sprinkled throughout by way of the cheeky dialogue, visual imagery, and an the occasional written document. 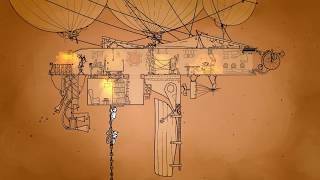 The game provides a sort of sidescrolling “world map” overlay in which the two characters you control can wander about the environments; primarily through their house and their rickety balloon driven steampunk ship. Different points of interest are scattered about, most of which initiate events in the form of mini games, puzzles, or a combination thereof, and allow you to progress further upon completion. For instance, you’ll need to collect keys and enter codes to unlock passages, power various mechanisms, and even work in tandem within the environment itself by way of cranking an elevator to lift you to your airborne ship. The puzzles range from simplistic to downright frustrating, and while a few could be better communicated, most of them usually end up clicking with enough teamwork and combined brainpower. While the puzzles are hit and miss, a good number of them were quite entertaining and provided plenty of laughs during our multiplayer sessions. I would have preferred if there were more puzzles to replace a few of the repetitive tea-making minigames, but overall you get a diverse palette of games emphasizing different characteristics and cognitive skills. There’s even an amusing boss battle that cleverly integrates co-operative movement and synchronization near the end of your run. 39 Days to Mars really demonstrates how collaboration can be a fun and satisfying endeavor when two people put their heads together and work towards a common goal. It made me think, react, and tested my mettle in new and interesting ways that, say, a mindless solo hack n’ slash, simply cannot. With that said, the enjoyment takes a noticeable dip when attempting to play on your own. The difficulty also spikes tremendously, and not in a good way. It’s admirable on the one hand, that any semblance of single player functionality is offered for this sort of co-op heavy experience. Yet, the solo gameplay amps up the frustration level to the point where the joy and intrigue of most of the puzzles regress into laborious chores. Couple this with some occasionally stiff and finicky point-and-click controls, and you’re left with a solo campaign that borders on unplayable in certain areas. I even opted to plug in a game controller to hopefully simplify things. Yet, I still often felt as if I was playing a digital version of “pat your head while rubbing your stomach”, as I was frequently forced to juggle two or more actions with weird button and joystick combinations. While a few puzzles can be reasonably controlled by a single player, most are simply designed around the concept of two hands working in tandem. Still, the game makes no secret of the fact that it’s crafted specifically for a co-op experience. You’re even warned at the start of the game, and upon initiating a single player mission, that “two players are suggested.” Are they ever. Unfortunately, there is no online gameplay to speak of - an odd decision considering the game’s emphasis on multiplayer. Nor is there any additional content, unlockables, or even much deviation or depth in the game itself, making for a relatively shallow end product. Considering the game is already quite bare bones in the content department, some sort of online functionality, speed run, or hard mode, could have gone a long way in fleshing out the content. At the end of the day though, is the game worth trying? Certainly - provided you can appreciate this quirky little puzzler for what it is, and you’ve got a companion willing to make the journey to Mars with you. You also may want to wait for a discount, as a $15 price tag is somewhat excessive for what amounts to little more than a glorified demo. Within the limited parameters of the game though, 39 Days to Mars offers a brief, but memorable multiplayer experience and a unique spin on the puzzler. The game does a lot with a little here, providing cute and simple line art reminiscent of a playable children’s story, neat steampunk themes, somber piano melodies, and some amusing voice acting to help inject some character and playful humor. The controls are usually basic, but prove a bit touchy at points, particularly when trying to nab small items or control multiple elements at once. Still, the point and click mechanics are serviceable. Most of the puzzles are creative and are fun to play around with. Undoubtedly the weak point of the game - you’re given a cat companion who’s paw works in place of an actual player’s hand. And no, your cat friend does not come with AI. You’re forced to control both hands, so tasks designed for 2 players get exponentially and painstakingly more tricky in a hurry. Working through each puzzle with a friend is clearly the bread and butter of this game, and it’s where the gameplay really flourishes. It’s just too bad there isn’t much there to flourish, as the campaign can be knocked out in a single sitting and there’s essentially no extra content. Everything ran smoothly in my experience for the most part, aside from the occasional bit of slowdown. 39 Days to Mars is serviceable, but there isn’t a ton of substance here. Most of the ingenuity and overall appeal can be found in the charming art style and some of the creative cooperative puzzles interwoven nicely into the gameplay. 39 Days to Mars is ranked #1165 out of 1434 total reviewed games. It is ranked #109 out of 146 games reviewed in 2018.